Watch as Jenee demonstrates the cold therapy laser and explains how it works! The treatment works by using light to penetrate into the deep tissues. It only works on tissue that has been damaged. The light triggers the production of energy in the cells, helping them to repair and heal. The procedure takes only minutes, and can be a pivotal way to help your pet return to normal activity rapidly. During the treatment, endorphins and other positive chemicals are released in the body, so your pet will feel good; similar to how you feel after a massage. The treatment time, and the number of sessions needed will depend on the specifics for your dog or cat. In most patients, the pet owner/care giver can and is encouraged to be present for the therapy. These treatments are done with in most cases without sedation. Cold laser should not be used in patients that are pregnant or have cancer. 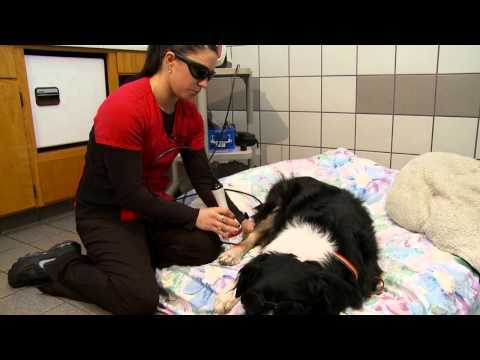 Ask one of our veterinarians if cold laser therapy could be helpful for your cherished companion.